Guru Ganesha Singh - songwriter, musician, recording artist, entrepreneur and founder of the Guru Ganesha Band, was an enthusiastic participant in the 1960's rock and roll explosion. When he embraced Sikhism and the Kundalini Yoga of Yogi Bhajan, he brought his love of Western music to the Eastern traditions of his new Sikh lifestyle. He was one of the pioneers of the new genre of Kundalini Yoga mantra meditation music, and since that time he has contributed greatly to its on-going growth and development. Guru Ganesha's emergence on the world devotional music stage took place at the beginning of the 21st Century. In collaboration with his good friends, Guru Singh and Thomas Barquee, he released the album A Game of Chants with the Grammy-winning singer Seal. 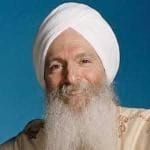 He also began to record as part of the Peace Family, a group featuring the angelic voice of Snatam Kaur.